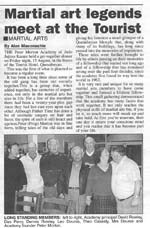 This article was published in the Queanbeyan Age on 22 August 2003. The Peter Morton Academy of Judo Jujitsu Karate held a get-together dinner on Friday night, 15 August, in the bistro of the Tourist Hotel, Queanbeyan. This was the first of what is planned to become a regular event. 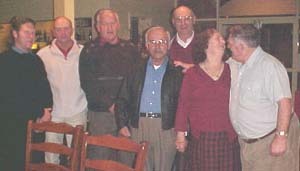 It has been a long time since some of the old gang has been out socially together. This is a group that, when added together, has centuries of experience, not only in the martial arts but also in life. For a few of the members there had been a twenty-year-plus gap since they had last cast eyes upon each other. Although Father Time has done a bit of cosmetic surgery on hair and faces, the spirit of each is still intact and ageless. Peter (Frog) Morton was in fine form, telling tales of the old days and giving his listeners a small glimpse of a Queanbeyan lifestyle that, along with many of its buildings, has long since passed into the memories of experience. These tales were further brought to life by others passing on their memories of a fellowship that started out long ago and of a fellowship that has remained strong over the past four decades, since the academy first found its way into the world in 1962. It is very rare and unique for so many martial arts members to have come together and formed a lifetime fellowship. This small gathering demonstrated that the academy has many facets that work together. It not only teaches the physical skills of martial arts but, if you let it, so much more will sneak up and take hold. At first you're unaware, then one day it enters your conscious mind and you realise that it has become part of your life.